Scott and I stopped by and checked this place out on Thursday, December 28 a little after lunch time. The friendly counter girl took our order and we adjourned to the homey dining room with a big plastic 8 which led the server to our table with our order. 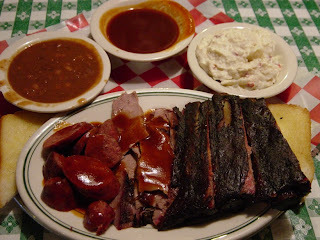 I went for the 3 meat combo platter with sliced beef, ribs, and hot links with sides of tater salad and BBQ beans. Texas toast came along unannounced and was a welcome addition. The sliced beef was pretty average, maybe less than average. Not much smokey flavor and fairly chewy. Difficult to cut with a fork, but you could do it if you worked at it. The hot links were not very hot, either in spice or temperature. In fact if I hadn't been assured they were hot links I would have thought they were just average sausage. Now the ribs, they were the highlight. A nice smokey crust on the outside and fall-apart tender. Just a tad on the dry side but I would have been happy to eat plenty more just like 'em. Scott noticed they have all you can eat rib nights on Wednesday and Thursday nights for $12.95. That's almost as good a deal as North Main, for ribs durned near as tasty. I shall certainly return to resample those ribs on a Wednesday or Thursday, soon. Maybe with faster turnover the slight dryness will disappear. We'll see.The sides were average. They do have 2 different kinds of tater salad, mayo based and mustard based. The mayo based didn't do it for me so I'll try the other next time. The beans were just average. The sauce here is an interesting mix of sweet and spicy. Vinegar based and Scott detected molasses along with some healthy pepper. It's a different taste and I liked it. 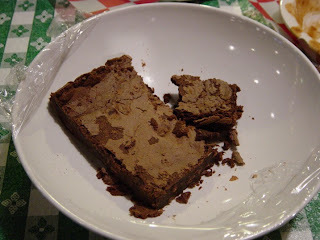 I had a great home made chocolate chunk brownie for dessert. The perfect send off. 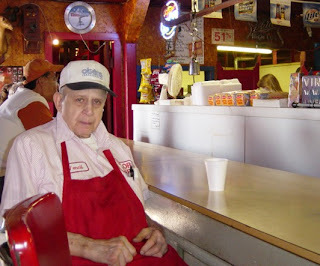 This is a friendly place with lots of regulars and the boss man was making the rounds saying hello and thanking all the customers for stopping by. Why would anyone want to live anywhere but Texas? Visited 12/7/2006 around lunch time. I thought it was pretty average. The sauce is a sweet sauce and I prefer a more spicy variety. It was perfect in the BBQ beans, though. The sliced brisket was moist but slightly chewy. Unfortunately, not much smoke flavor. The brisket really needed sauce but I wish I had brought some 406 brand from North Main. 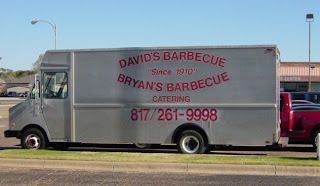 They were very generous on the brisket! I think they gave me about a pound on my 2 meat combo plate. The ribs were a bit chewy and without much glaze or smoke flavor. The potato salad was pretty good, probably a 4 out of 5. 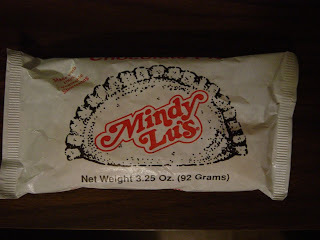 The fried pie I had was chocolate and is Mindy Lu's. Manufactured by The Pie Company, Fort Worth, 817-457-7437. It was ok, but I think I would have prefered a Shipley's chocolate creme donut. Lemon might have been better. I did love the atmosphere of the joint. They have a couple of mannequins playing cards at a little table in the front and a Jed Clampett "Y'all come back now" sign at the front door. A couple of good ol' boys were sittin around a table having a late lunch swapping stories about going dynamite fishing and generally yucking it up big time. 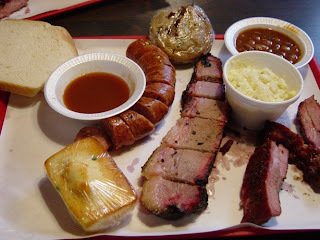 This was our second trip to The Roadhouse and we confirmed this is a "find" off the usual BBQ circuit in central Texas. 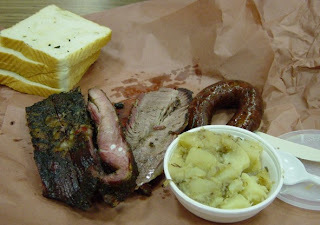 Excellent smokey brisket that was tender and juicy, peppery ribs, decent sausage. The jalapeno cornbred was a bit crumbly this time, but the pinto beans were the best I had this trip. 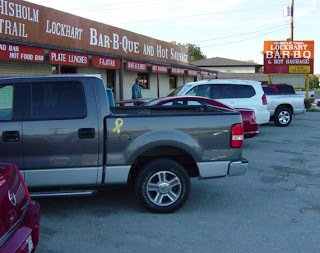 Put this place on your BBQ to do list. We noticed they are closed Monday, lunch only Tues-Thurs, 11-8 Fri-sat.Outside photo in last years trip log. 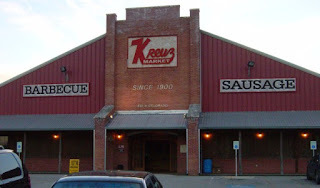 Kreuz is a genuine BBQ palace, built from scratch, about 15 years ago as the new home of a famous Lockhart institution. 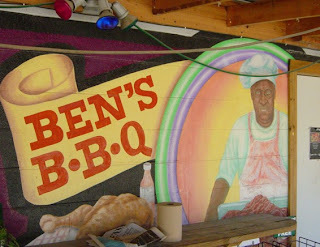 Some may complain that the atmosphere may not be "funky" enough for a BBQ joint. To that I say: shut up and eat. You get the same quality meal as at Black's, just down the street, but without forks or sauce. 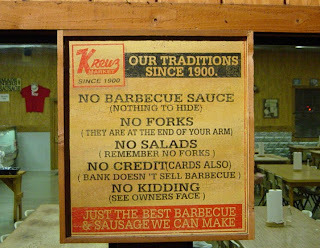 They just don't "do" forks and sauce at Kreuz and they really don't need 'em. The Q is that good. The ribs here were a bit chewy. A consistent problem on every spot we visited this trip. Ditto the brisket, but the flavor was wonderful with plenty of smokey goodness. I also had a jalapeno cheese sausage ring that was the best sausage I have ever had. If I'd had a cooler with me, I would have brought a box of 25 rings home with me. Next time, I will have a cooler. The German potatoes were an excellent side dish and I think I could make a meal of just those, as well. This is a place I have been hearing good things about, so we hit it at lunch on a Monday to see what was what. The pork ribs were the meat highlight with a nice peppery rub, though they were a little chewey. 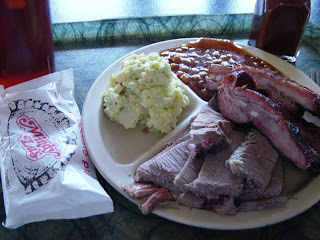 The brisket didn't taste like BBQ at all, more like roast beef! The sausage had an extra tough casing and the meat itself did not have a lot of flavor. The sauce was definitely different. It tasted sort of like watered down honey with chili powder added. Pretty different, but it didn't work for me. Now the sides, they were something else. The green beans had a nice flavor, unlike those I had at several other joints this trip. The potato salad was the best I have had ANYWHERE. And I've had me some tater salad, believe you me. 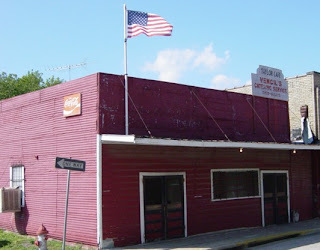 I can't wait to go back and have just some ribs and tater salad here. 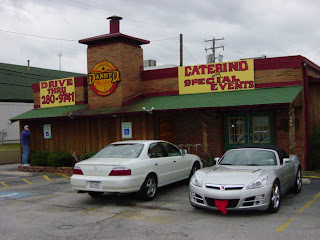 Here's a place we didn't try last year, and while still gunshy from our near tastebud destroying experience at Bill Miller's house of horrors, we decided to give 'em a shot. 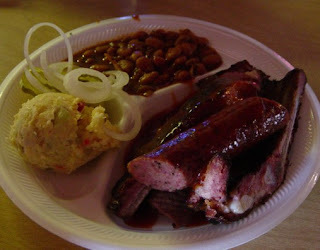 We were pleasantly surprised, especially at the ribs and sausage, which ranked close to Black's (this trip). The brisket did not fare quite so well and the sides were very average. The big kicker here is the price. 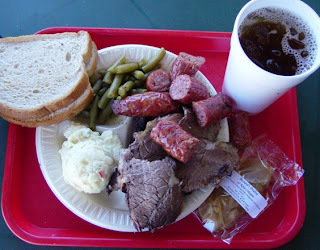 $6.95 for a 3 meat plate with 3 sides plus tea! I think if we had stuck to the rib plate and left the sides alone we would easily have called this the bargain of the trip. Unfortunately, on the 3 meat plate, you only get ONE rib and that was just not enough. 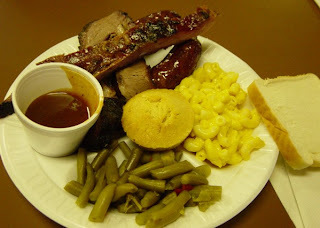 One of the stone winners in last year's BBQ tour, this is still a solid feast. Everything here is excellent, though the ribs this time were not as tender as last year. The jalapeno sausage rings were tasty, but just a bit dry. Put that down to the vagaries of BBQ. The brisket was as good as it gets. Great smokey flavor, tender and juicy. The food here is great. Outside photo in last year's trip log. 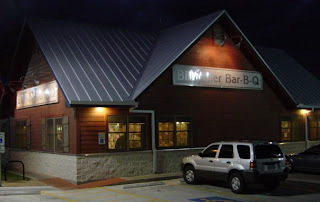 Bill Miller BBQ. 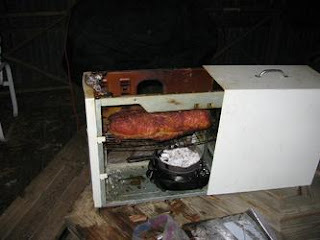 WORST BBQ ever!! Stay FAR away from this chain!! Our experience was too horrible to write about, so I won't. 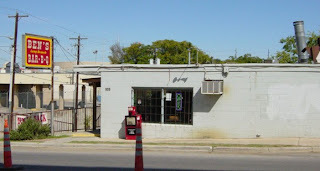 In Dallas we have small chains like Sonny Bryan's and Dickey's which fix some decent Q. Pity Austin. Poor, poor, Austin! The BBQ was quite good though the sides were not too exciting. 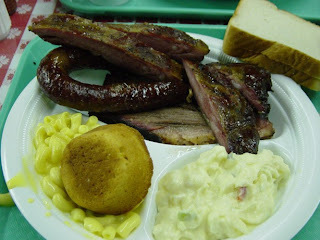 The ribs were probably the highlight, though the Turkey Sausage was pretty good, too. Calories and Cholesterol tour 2006! Once again, your intrepid explorers set forth on adventures in BBQ!! A short trip this year, as Scott had to make a short week of it, but we made the most of what time we had. Eight different BBQ meals in four days. Some good, some great, one horrible, you can find all the details laid out below, with pictures. 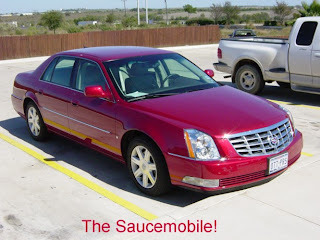 As usual, we rented a big ol' Cadillac to travel in style and were pleasantly amused to find out it was BBQ-sauce-red in color. We immediately dubbed it the "saucemobile".